STUNNING MOUNTAIN VIEW! Your future home is your personal slice of heaven in desirable Bannockburn subdivision in desirable Franktown! 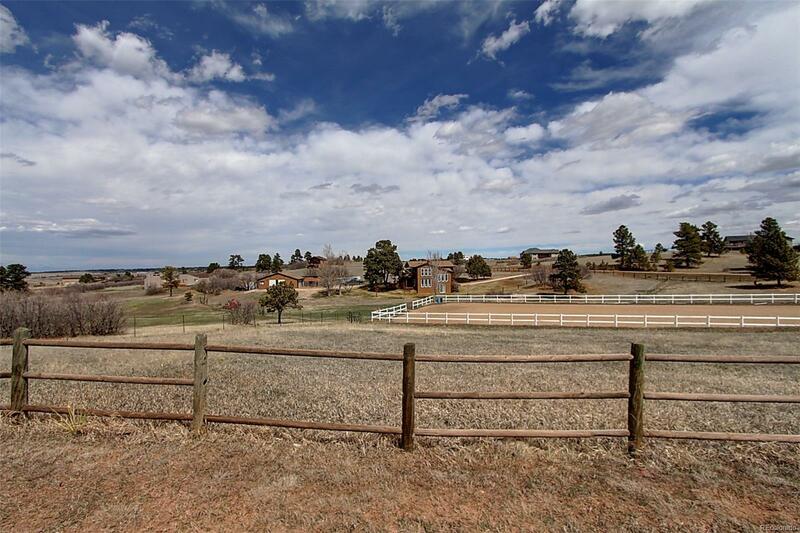 Single-family home is located on 6.6 acres of horse property and features a 4-stall Barn(36 sq ft) with Tack Room, Hay Storage, and turnout into pasture; 200x90 Riding Arena, and Cross-Fenced Pastures! Multi-level home offers 4 Bedrooms (including 1 non-conforming), and 3 Bathrooms, formal Living Room with fireplace, brick surround, and vaulted ceiling. Main level has large eat-in Kitchen with exposed brick and new Pergo wood floors, formal Dining Room, and 3 Bedrooms, including the Master, which features a private bathroom, big walk-in closet, and private access to the expansive back deck with mountain views! Lower level family room with wood stove and finished basement are both walkout. Some furniture in included in the sale of the home. Covered deck off the lower level has hot tub! MUST SEE! Call now to schedule your personal showing!